Ofcom has told Royal Mail it must improve "important aspects" of the service it provides to postal users after missing key performance targets. It said Royal Mail had missed its target of delivering 93% of first-class letters the day after they were posted, achieving only a 91.7% rate. The regulator said the company could be fined if it missed targets in future. However, it added that the recently-privatised Royal Mail was on a "stronger financial footing". Last month, Royal Mail floated a 60% stake in the company on the London Stock Exchange. "Ofcom is concerned about Royal Mail's failure to meet certain service targets, and has made clear to the company that it must take all necessary steps to meet these in future," Ofcom said. Royal Mail missed a target of delivering 91.5% of next day deliveries for first class mail in nearly all postcode areas of the UK, hitting the target in only 62% of postcodes. However, the company met other targets, including delivering 98.5% of second class letters within three days of collection. Ofcom said it would continue to monitor Royal Mail's performance closely. "Should it miss the targets in future, Ofcom will consider opening a formal investigation which could result in enforcement action, including the possibility of fines," it said. 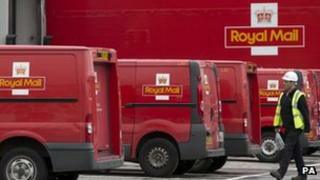 A spokesperson for Royal Mail said Ofcom found 86% of customers were satisfied overall with the postal service. But they added: "We were disappointed that we didn't meet all of the regulatory quality of service targets we were required to last year. This remains a key area of focus for us." The postal service had the "highest service specification of any major European country" and took its performance "very seriously", the spokesperson said. The spokesperson added: "We are focused on continual improvement in the service we provide for our customers." Peston: Was it sold too cheaply?